Finally, a real shelf bust dress! 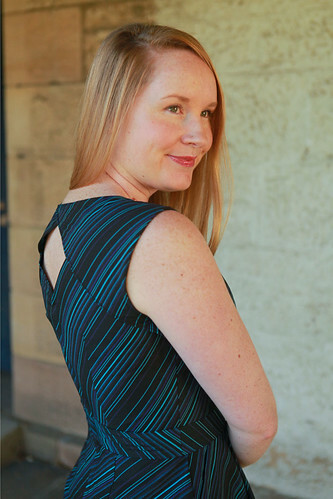 This is Butterick 6167 from the Patterns By Gertie line. 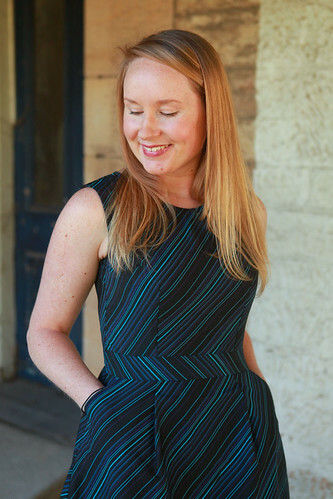 This also happened to be my 34th birthday dress – yay! The fabric is also from Gertie and I picked it up at JoAnn Fabrics. I won’t lie, I had a heck of a time with fitting this thing. I made so many alterations that it was hard to keep track of. You can read all about the headache on my blog. I actually almost gave up – but I’m glad I didn’t because I think it turned out really cute! I thought to share some photos of this beautiful dress, I was inspired by the pattern “7075 Advance”, although I drew the patterns to make the dress look like the original pattern. You can see more about it here . For my first post on We Sew Retro I picked Gertie’s new Butterick pattern. I’m a such a sucker for vintage styles! 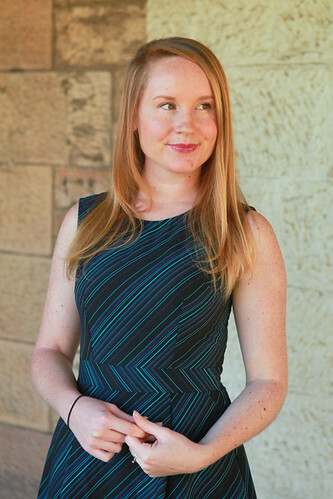 The dress was really easy to make and didn’t take too long – I made it in one short weekend! I used a stretch sateen on both the dress and contrast. 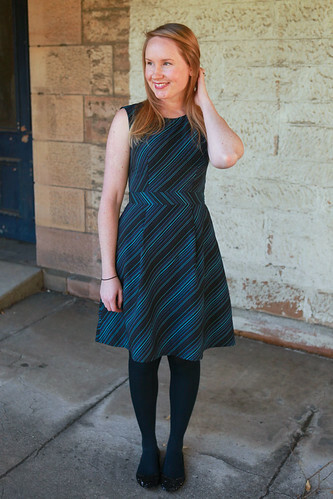 This pattern runs true to size with Butterick but does include a lot of ease. 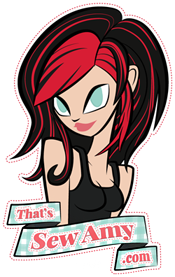 Next time I’ll be making it smaller for a more pinup type of look. To check out a more detailed version my review and more pictures visit my blog: That’s Sew Amy! I managed to make a few things to show off before my sewing machine hopped aboard a ship and this Belladone is one of them. I made this almost straight after I had finished my Airelle Blouse because I was on a Deer&Doe kick, and because you know, new patterns are exciting! Especially when they are of the birthday present variety. I used some amazing blue and black diagonal striped cotton, that actually has some one-way stretch in it that I hadn’t realised until I went to wash it. I was kind of annoyed, but got my Tim Gunn on and made it work!! Also, I really like the diagonal stripe. I think it’s quite unusual for fabrics these days who seem to prefer a vertical or horizontal stripe. Those fabrics are so missing out! I made the dress almost straight out of the packet, except for a few minor things. I narrowed the shoulders, made the join at the top of the back bigger (I was worried about it possibly stretching out a little due to the stretch in the fabric), made the skirt longer and omitted the skirt hem facing, instead doing a simple rolled hem. 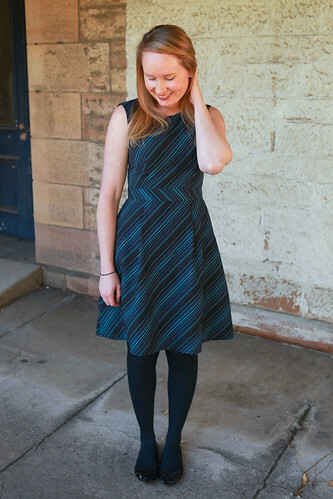 I’ve never actually come across a skirt hem facing before, have you? Due to my time restrictions I opted to leave it off, but I think I’ll give it a go with my next Belladone (as there will be a next!). I thought it would be fun to cut the waistband with the stripe going the other way, making a small lightning strike across the dress (well, I think it looks like a lightning strike…). Also, to break up all that diagonal stripey goodness, I think it needed it, otherwise there would be the possibility of too much stripe (can there be too much stripe?). For more construction details and photos, head on over to my blog Jennifer Lauren. Hi all! I’m not sharing today but rather asking for your help! I have been invited to a prom-themed birthday party for a friend. We are all about ten years or more out of high school. I never went to my prom, and neither did she, but I really want to make this awesome. I’m still very much up in the air about the dress I want to do for this, but here are a few I’ve seriously considered. The first one I really like the very classic and conservative lines. Neither of these are vintage, but I fell in love with them just the same. What’s my question? 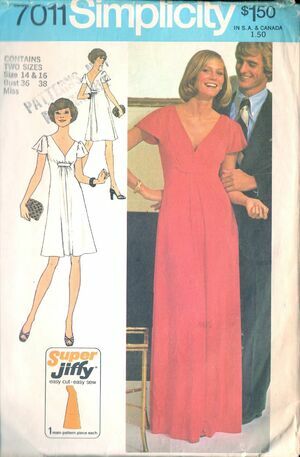 What are some vintage dress patterns that would be prom-appropriate that you can think of? I’d love to find one to fall in love with and go that route instead! I do have a few prerequisites though for you to consider. I would prefer a fairly sleek silhouette, but I’m not adverse to a full skirt. Full length preferred, but others are okay too. 1950’s and previous I’m very open to, as some 80′ s styles. Sleeves are very welcome as we may be outside quite a bit for this event and it is being held in November! As I said, I never went to my prom, so this is my chance to do it and I want to look amazing!I never have opportunity to dress up like this. Anyway, show me what you’ve got! I need some fresh ideas, and if you’re already sewn the dress in question, I would love to see photos of the finished item to get a better feel for it. Just recently finished this dress (getting the bulk of it done over Memorial Day weekend), based on the 1970s Simplicity 7011 pattern. The construction was pretty simple, except for the portions where I altered the border print placement. A great summer dress, I think, and I got compliments on it all day! Pictures and more details on the construction and alterations I made (minimal) can be found at my blog. And just to make sure I’m giving enough information on these blogposts at We Sew Retro, please let me know if you want more information included here before I direct you to my blog. I want to make sure you enjoy the read here, but also don’t feel I’m waxing overly detailed either.